I'm a little dubious about this. First, I'm a scaredy-cat about hotspot political issues like Ireland. But second, I'd worry that we'd then have two places to put information about the Republic: on Ireland, and on Republic of Ireland. You are strictly speaking correct, but the Republic of Ireland is the country's legal description as stated in the Republic of Ireland Act. As a new wikitravel user (and a citizen of Ireland), I have an interest in this conversation. Firstly, I also edit on wikipedia, and conversations on this topic can get *VERY* heated at times over there, so it's nice to see it kept on an even keel here! I would say that there are merits on both sides of the arguement regarding having a disambiguation page or not. Personally, I expected there to be one when I came here, and I automatically searched for Republic of Ireland rather than Ireland (perhaps that's my wikipedia training!). Speaking as someone living here, I personally see the two jurisdictions as being distinct and different, and from that point of view, perhaps they should have two articles. However, this site is primarily for travellers and tourists, and I don't know whether they would view it as one country or two, particularly since the whole peace process, and decommissioning of arms by the IRA, Etc. There is a border between the two jurisdictions, but it is largely un-manned, given that there is a common travel policy between Ireland and the United Kingdom of Great Britain and Northern Ireland (to give it it's full title). On balance if I had to express a preference for one article which covers Republic of Ireland and Northern Ireland or two separate articles, I think I'd plumb for one article, but make sure that the two jursidictions are treated with respect, or Northern Ireland could get 'lost'. From a traveler's perspective, there are no border controls, hence Ireland is one tourist destination. The two Congos and Koreas have border controls (to say the least) as well as serious differences in their cultures and social structures, whereas the "Irelands" simply do not. When I visited Ireland, I certainly didn't think of it in terms of the North and the South, I thought of it in terms of "Belfast area," "Dublin Area," "Dingle," etc. This reality is well represented by the fact that we actually have Northern Ireland listed as a region of Ulster. I think this is a good example of how Wikitravel's policy of privileging sovereignty does not necessarily help the traveler. Regardless of what "country" you are in here, you are really just traveling around Ireland, the island. Why privilege politics over travel? I've been working on adding information to the Ireland pages based on my recent trip which included 2 months in Ireland, and I found that using the four Provinces as a seperate page was kind of annoying, and not that useful from a travel guide point of view. For one thing, aside from knowing that County Galway, where I spent most of my time, is in Connacht, and that Northern Ireland is most of Ulster, I have no real idea as to where the boundaries of the provinces are, so just seeing the four of them on the main page wasn't very helpful. And I've already been there. The other problem I was having with the previous setup was that there was very little to say about each province except what counties and cities were within them, without repeating information that would be more useful on the pages for the counties and cities. So what I did was move all the names of the counties into the regions list, using the provinces only as secondary headings. Of course the disadvantage is that this makes a 30 lines long list, which is a bit of a pain too. I agree in theory. But I was also in Ireland this summer, and the new long format would have been much more useful. I looked through the geographical hierarchy and I can see where you're coming from. The problem in Ireland, more significant than just the short pages in between national and county levels, is that the regional names are rarely, if ever, used, and the names mean nothing to the uninitiated. This makes the Irish situation somewhat different from, for example, the US, where if you say "Mid-west," even if you don't know the country, there is still some geographic meaning. "There are many Irish people who will hold visitors in higher esteem if they make the effort to learn and speak some basic Irish phrases, especially in tourist centres and pubs." 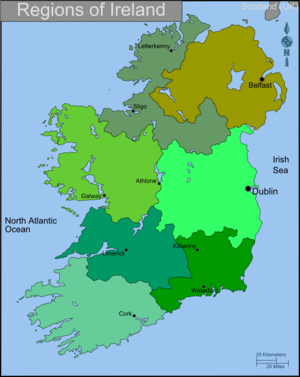 Here are some external links for Ireland that some WikiTravel users added and may be used for reference. This page was last edited on 10 May 2010, at 00:35.